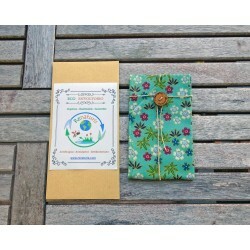 Renaturis Eco Food Wraps are a natural alternative to plastic and aluminium foil. Our wraps are 100% organic, reusable and sustainable for the enviroment. Handmade using 100% organic cotton fabric (GOTS certified), beeswax, BIO jojoba oil and tree resin. Theses food wraps have antibacterial properties that keep your food fresh longer. You just place the wrap over a food or the top of a container and press with the warmth of your hands. After a few seconds, the wrap will hold its shape when it cools to keep it sealed and fresh. It can be stored in the fridge or the freezer. It can be washed with cold water (avoid hot water) and mild dish soap, then air dry. It can last up to 1 year with proper care. For more information please visit our blog "Renaturis World".